The acquisition of Roto Hammer adds a market leading and comprehensive range of valve chainwheels to the Rotork Gears division portfolio of valve gearboxes and valve accessories. 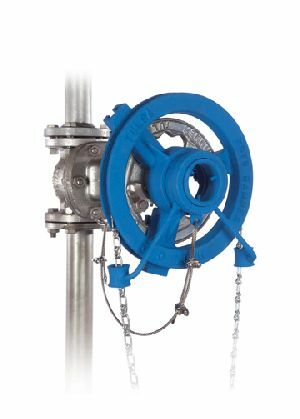 The Roto Hammer range of chainwheel core products enables hard to reach and stubborn manually operated valves to be safely operated without risk of injury. During the company’s 50 year history its range of products has grown to now include valve extensions, floor stands, gear operators and customised solutions. These products complement Rotork Gears’ existing range of products and services, increasing Rotork’s presence in the important USA market and further strengthening its capabilities as a supplier to the global valve manufacturing industry. Over half a century ago, a pipe and fitting specialist noticed that too many field workers were sustaining injuries while trying to force open stubborn valves in hard-to-reach areas. His innovative solution was a chain wheel that he called the “Roto Hammer”, a product which harnessed the principle of a hammer striking an anvil to safely open and close stuck or frozen valves in a manner that protected the operator from injury. Roto Hammer Industries opened for business in Tulsa, Oklahoma in 1959. More than fifty years and several additions later, Roto Hammer remains in the same location and continues to offer the very best in solutions for hard to reach and difficult to operate valves. Find out more about Roto Hammer products.